WHAT ARE THE RHYS METHOD LIFE PURPOSE PROFILES? The Rhys Method Life Purpose Profiles are a core part of the exclusive Rhys Method Transformation system taught exclusively as part of the in the Rhys Thomas Coaching Programs and at the Rhys Thomas Institute to train Coaches, Managers, Leaders, and Energy Mastery Practitioners with the most cutting-edge personal growth and healing knowledge and techniques available in the world today. The Rhys Method® Profiles teach you how to see your life purpose. WHERE DID THE RHYS METHOD LIFE PURPOSE PROFILE SYSTEM COME FROM? The Rhys Method® Life Purpose Profiles are based on the psychological work of Dr. Wilhelm Reich and Dr. Alexander Lowen that focused on how the character of an individual arises or is stifled through trauma, or early core wounding in childhood which in turn affects both their mental and physical health. Through working with thousands of psychiatric patients in sanitariums as well as their private clients, they found that mental health could not be separated from bodily health. Their work stood in opposition to Freud’s work which was focused solely on the mind. Reich and Lowen discovered there were five distinct character types of people with five distinct types of body, mental and emotional gifts and deficits. These five group qualities were so pronounced that Lowen and Reich would challenge any psychologist to bring them any patient and within minutes they could hand them back a detailed history of this person’s life challenges, long-term behavior patterns as well as why they presented with the specific neurotic tendencies they had. They also included in their report, specific body therapies that would bring about both mental and physical stability when practiced. Lowen and Reich called these five personality types “Character Structures” and saw them as results of early childhood wounding and later the underlying motivators in a person’s life. They also showed that certain emotional constrictions or excesses in the body created very pronounced physical attributes. They spent many years developing a full body approach to mental and physical health based on the premise that both mental and physical health issues are not random but are rather the cause of energetic restriction in the body which limits the person’s ability to express their feelings or needs in the moment. Through many years of study and mastery of the Character Structures, Rhys stumbled upon a deeper truth–it is the core human quality that holds the secret to humankind. The secret that was not fully captured by Lowen and Reich is that people are not created or molded by circumstance, they are revealed by them. There are not five ways that people behave based on their life situations, or wounding, there are five very distinct spiritual species of human beings, or “soul” qualities in individuals that react in five general ways to the challenges of living a human life! The Rhys Method® Life Purpose Profiles have been developed to make this amazing discovery understandable and accessible to all people. Based on Lowen’s five Character Structures, the Rhys Method® focuses on the positive core soul qualities he calls the Five Life Purpose Profiles. Rhys developed this system by watching the amazing transformation of thousands of Energy Mastery School students and private coaching clients. WHAT ARE THE FIVE LIFE PURPOSE PROFILES? WHO IS THE RHYS METHOD PROFILE SYSTEM FOR? Everyone! Whether you are a doctor, an employer, a coach, or a parent, being able to see the profile in yourself and in others teaches you a level of rapport and compassion you have never had before. Knowing your profile is knowing your life purpose. Making life, business and relationship choices from a deep sense of self knowing leads to inner peace. Choices made from a confused person, even when something works there is anxiety and discord. 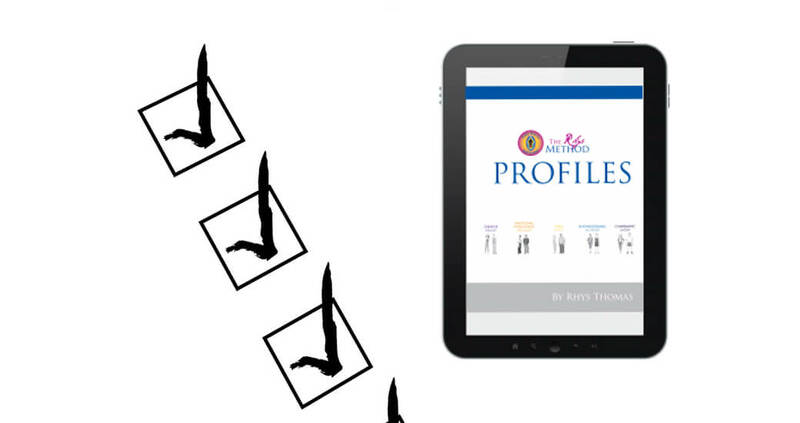 WHAT ARE THE BENEFITS OF THE RHYS METHOD LIFE PURPOSE PROFILES? By learning your personal Life Purpose Profile you will learn exactly what it looks like/feels like/sounds like when you are in your power (feeling empowered and truly YOU). This is called your “core soul profile quality.” You will discover that your life purpose is never a thought, or a job, or another person, or some object, goal or amount of money you can earn, it is always the person that you bring to all those events not the event themselves. You will also learn when you are in the dark or are unconscious to your life purpose. This is what is called your “defense” or shadow and where you feel disempowered by your life. Each of the 5 profiles act very differently in the world and so will also have specific ways they sabotage themselves and go into defense. Understanding your life purpose can instantly increase your self-esteem, enhance your health and well-being, support your making positive life choices, let go of stress and limited thinking and behaviors, challenge your mental blocks and performance blocks, enhance your every relationship, teach you to understand the motivations of others to enhance your family and work life, and even help you understand and easily deal with challenging or difficult people in your life. This is a profound, life-changing experience that will unlock so much information about why you do what you do and how to align consciously with your life purpose. You also will unlock the key to your relationships—who you are choosing and why certain people really trigger you while you adore others. The profiles will profoundly affect your perspective and understanding of all the significant people in your life-–past and present—as well as the importance of living in your core in all you relationships from this moment on. If you are a coach or therapist, the profiles will help you gain an uncanny ability to read your clients quickly, gain instant rapport, amaze them with your insights and tailor your modality in a highly specific way to quickly and intelligently fill their exact needs. Your life purpose is all you truly ever need to achieve. It is the success you dream about, and it offers you mastery in your life at the material, emotional, and spiritual levels.